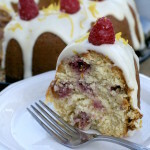 Lemon Raspberry Bundt Cake - What the Forks for Dinner? 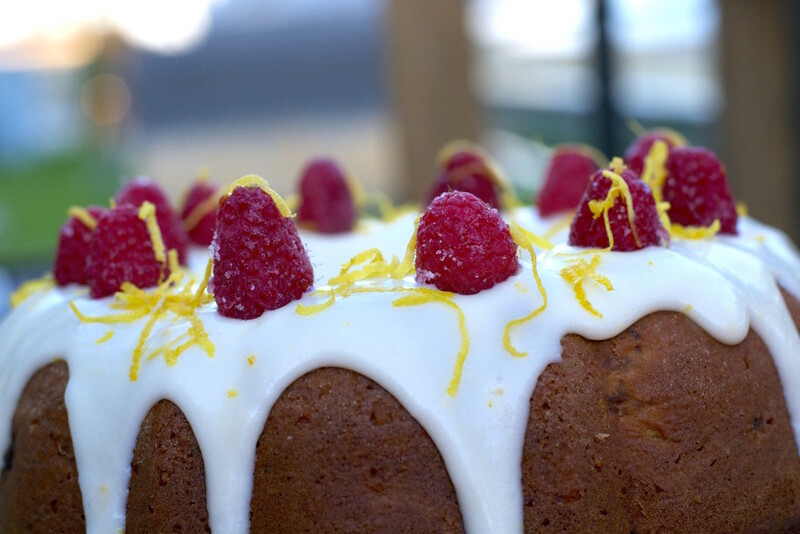 #cakemonday ………..what an perfect idea! I know I sang the praises of my school co- worker and fellow food blogger Kelly, at Team Cuisine in a recent post, but this is in ingenious idea. Plus……I get to bake!!!!! And eat cake!!!!! Years ago, I was the bakery manager in a small town grocery store. It was a great job……early morning……..I am a morning person….or was….lol. It was also a creative outlet…..something I enjoyed very much. I always found it amazing that people thought I made all the items we sold at the store from scratch. It still makes me smile and shake my head. I was a fake and bake…..no really its true. Most things came either in a ready to bake dough or they were already baked. Now before you become a hater, know that almost all grocery stores do the exact same thing. Besides, I didn’t really think I could bake, especially cakes. I tried a couple of times, but they always seemed dry and dense to me. I think I was just waiting for the perfect opportunity to do it right…….What the “Forks” for Dinner? and #cakemonday are those opportunities. And not to brag on myself but…….I’m kinda awesome at it!!!! I know whoda thunk????? 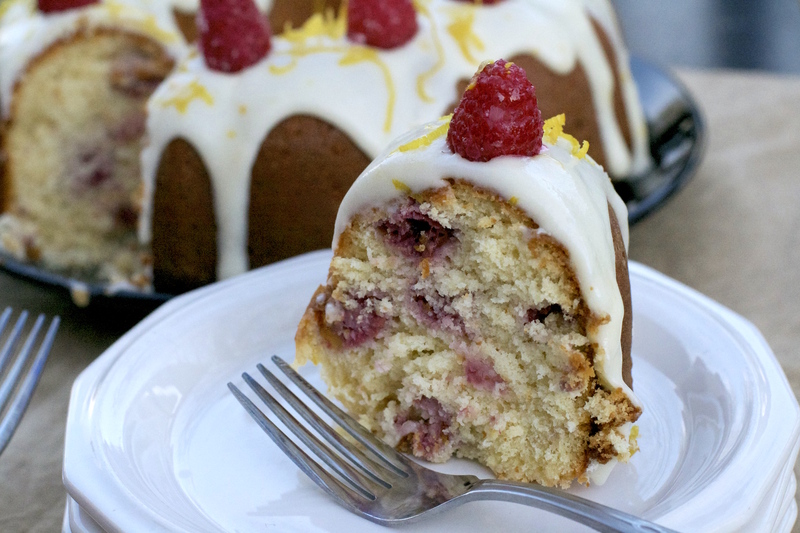 Lemon Raspberry Bundt Cake……is a case in point. 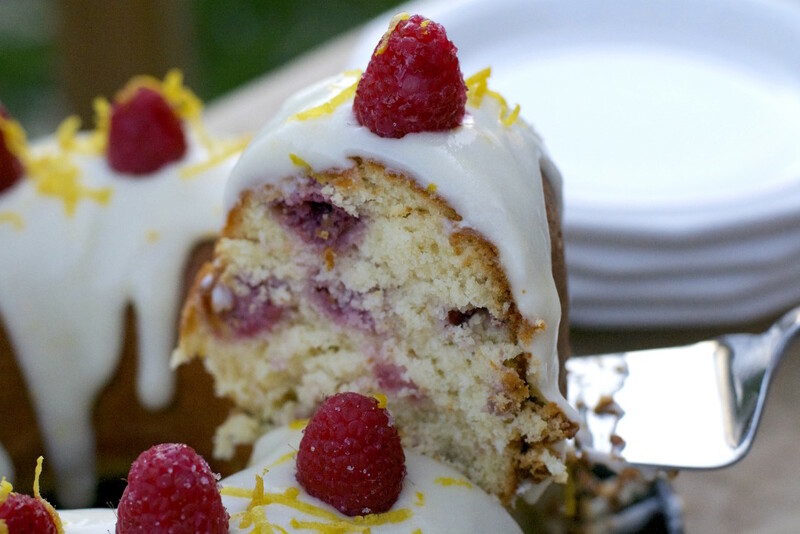 This cake is fresh, lemony, moist, and with a hint of raspberries……..yum! 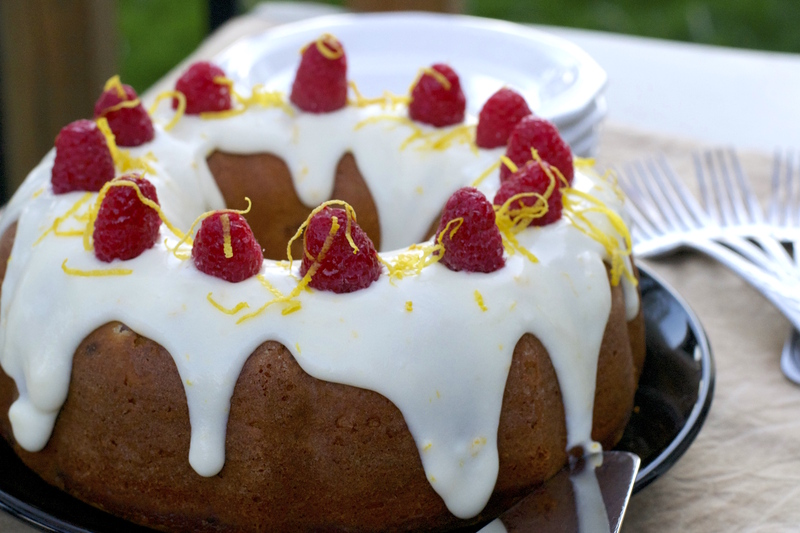 Using a bundt pan make it easy to bake, easy to decorate and easy to tote ……….important for #cakemonday or those times its your turn to bring dessert. 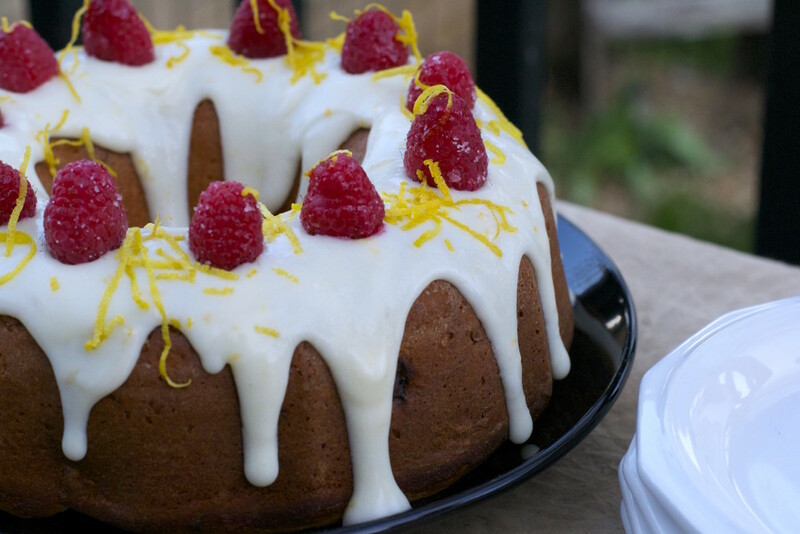 The glaze is cream cheese, more lemon, and powdered sugar……no fancy frosting skills needed, just a glaze……mix and pour it, how easy is that? Drop some raspberries and lemon peel on top….. perfection. 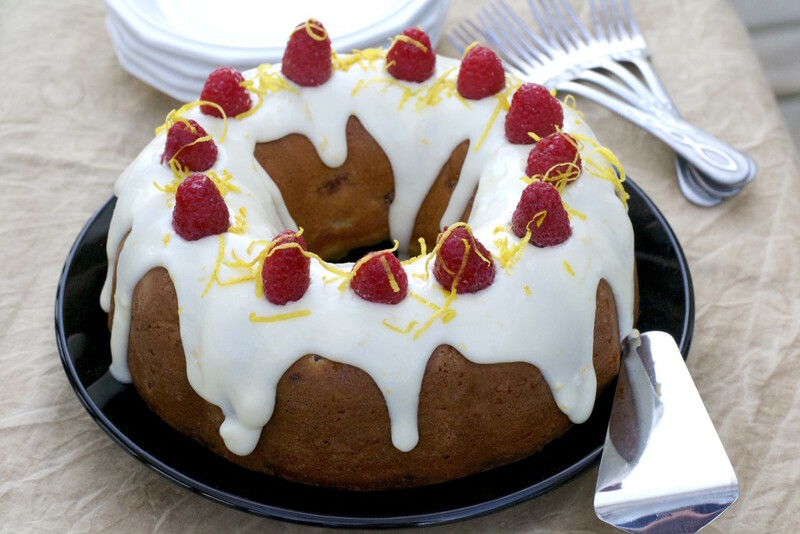 Next time you need to provide dessert, or if you want to start your own #cakemonday ……try Lemon Raspberry Bundt Cake………all bake ….no fake! Preheat the oven to 350F. Spray bundt pan with nonstick spray and dust with flour. Set aside. Using a handheld or stand mixer with a paddle attachment, beat the butter on high until creamy – about 1 minute. Add both sugars and beat on medium-high speed until creamed. Add eggs and vanilla. Beat on medium speed about 2 until everything is combined. Scrape down the sides and bottom of the bowl as needed. In a large sized bowl,sift together the flour, baking powder, and salt. Beat on low speed for about 5 seconds, then add buttermilk, lemon zest, and lemon juice. 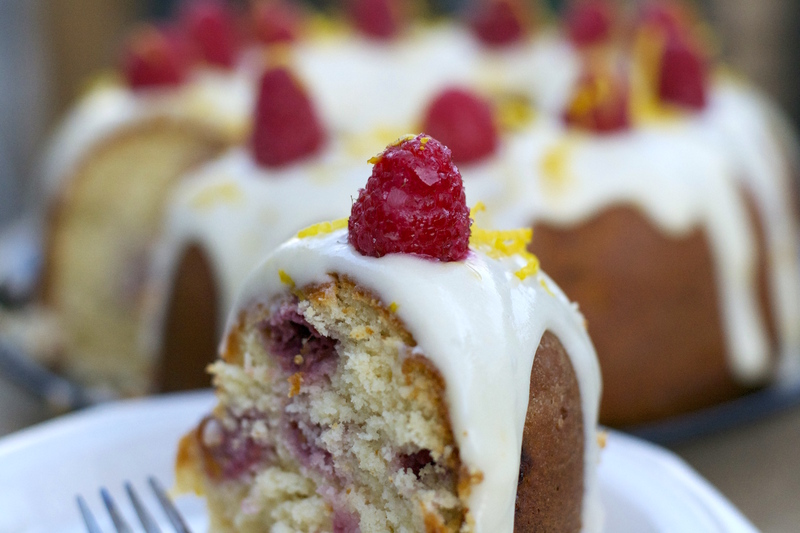 Toss the raspberries in 1 Tablespoon of flour and fold gently into the batter. Bake in preheated oven for 40-45 minutes or until a pick inserted comes out clean. Beat cream cheese and butter until throughly combined. Add remaining ingredients and beat until smooth.